Thanks for being a part of our social poker league. Riverchasers is PA's largest social poker league, also serving local markets in NJ, DE, and MD. 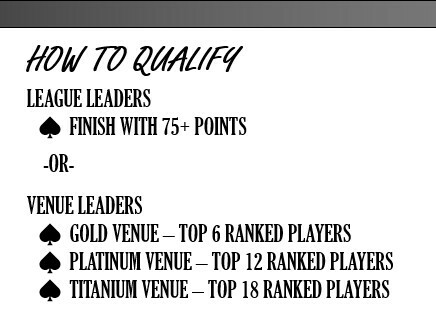 Play Riverchasers and win nightly prizes, earn league points to qualify for local and seasonal championships. Finish Top 3 at any event to earn a Bar Poker Open Token and you're only one step away from qualifying for The Bar Poker Open National Championship, North America's Largest Social Poker Event awarding over $350,000 in cash and prizes each year! Check out the events below and be sure to follow us on social media for daily content and promotional events! 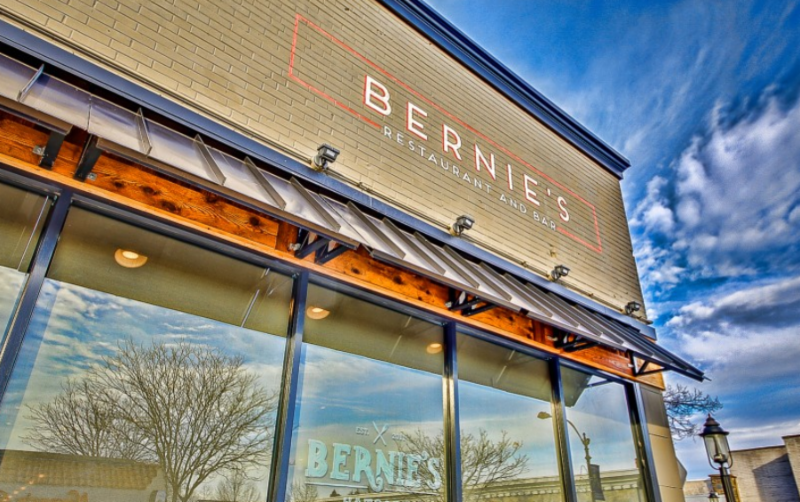 Bernie's brings you two weekly events on Monday and Wednesdays in the Hatboro/Horsham area. Join us downtown Hatboro starting 2/4 for dinner and entertainment. Win Cash, Prizes, and Bar Poker Open Tokens each week! All events have no buy-in, but please support the venues with food and beverage purchases. Join us for our the Premiere of our ROCKET TOURNEY. Similar to the Hammer Tournament, this is a prize-added tournament hosted by Riverchasers but open to all Social Poker league players within the Bar Poker Open Network, and our verified guests. 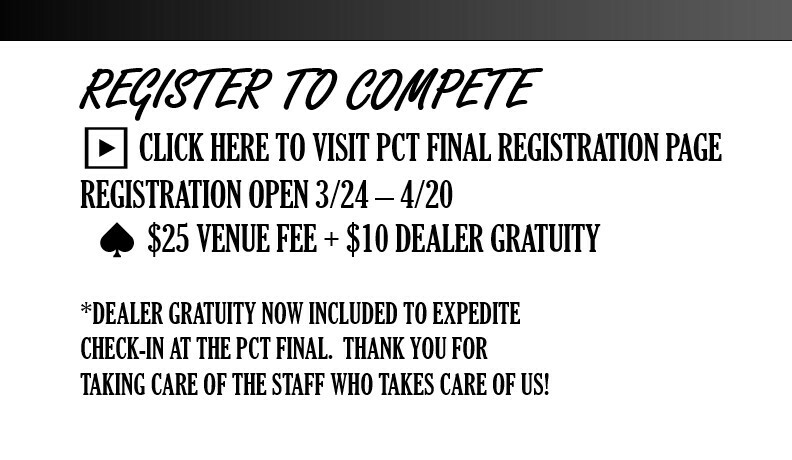 The $103 entry fee covers EVERYTHING for you, including entry, dealer fees, and even the dealer gratuity. This year, we have increased the capacity for the event up to 400 players! With over 300 players attending the Hammer Tournament in August, we hope to see everyone again this March competing for more Bar Poker Open Vegas Travel Packages, an even Larger Prize pool, and the bonus cash prizes possible on every single hand dealt! Visit Riverchasers.com/Rocket and follow the two step registration process (RSVP, and Payment) to secure your seat in this unique event. ﻿/PLAY is the Riverchasers Online Social Poker Site. ▶ Riverchasers.com/PLAY to login or create your free /PLAY account. WIN 2X YOUR ROCKET ENTRY! /Play in our Online Freeroll and compete for your Rocket Tourney Entry! All players must take seat and be dealt cards prior to 10:45am in order to compete. 2nd Place: $50 towards your Rocket Tourney Entry. 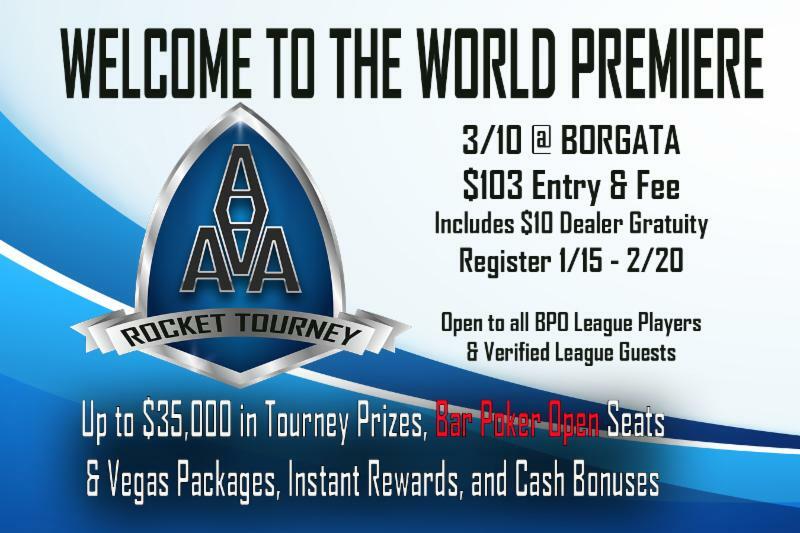 All Prizes paid in Borgata Chips at Rocket Tourney. 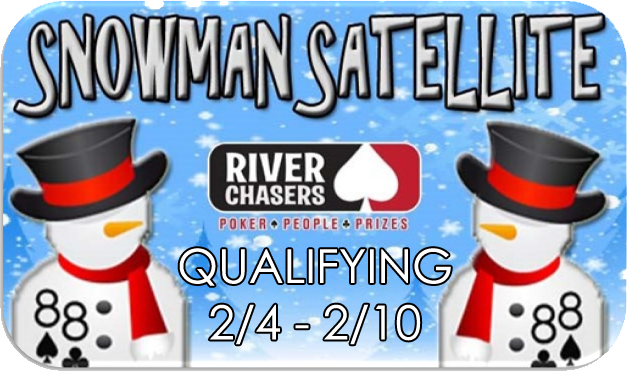 Play and win any RC event league-wide from 2/4 - 2/10 and win your Satellite Seat for the 2/23 Snowman Satellite Final!